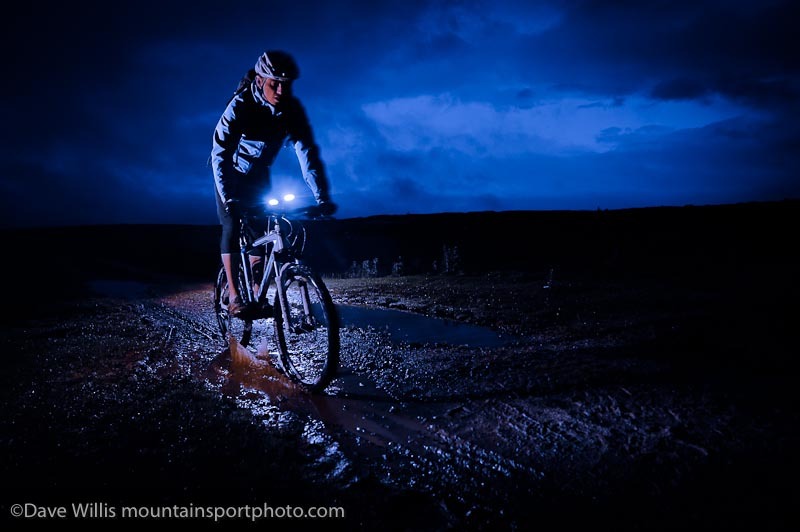 So, here's a second installment on shooting LED torches at night with some live action - in this case mountain biking. These photos were created to illustrate the power and useability of the clients new outdoor LED lighting products so we wanted to produce some photos that showed them in realistic, real-life situations, that would be eye-catching and have some impact. I brain-stormed this one for a week or so, waiting for the weather to be less than epic, with my mountain biker primed to be ready for my call. 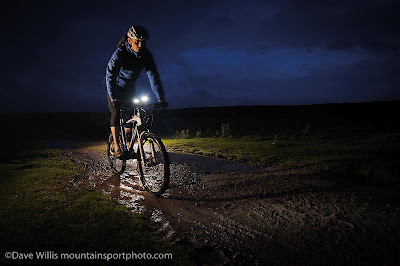 From my previous outing with the trail runners, I learned a couple of things; I would have to stick my camera on a tripod and use a fairly slow shutter speed to get the ambient light in the night sky. A black sky would look rubbish! No ambience, no atmosphere, to context - no good! I also learned that if the action/model moved too fast during the slow exposure, the LED's would create a light trail - which I didn't want. I wanted the photo to look natural with plenty of sharp detail. Light trails are fun but they don't look natural. OK, so my rider couldn't just blast down the trail. I also learned that to get the LED torches to really show what they could do, I would need a long'ish exposure. If the exposure was too long, the bright light tended to wash out or over-expose the foreground. So I might need to cheat a little bit here with some extra lighting to light the background. Basically, with torchlight, if you're not careful, get the foreground right and you don't see the background, but get the background showing and you wash out the foreground. Once on location I used the remote speedlights in a, for me, standard set-up; An SB800 on a lightstand with shoot-through umbrella to camera left acting as main fill light; An SB600 remote on a short stand about 4 meters away to camera left, lighting the rider from slightly behind, zoomed through a snoot, and an SB28 remote speedlight in a waterproof box, on the ground, behind where the rider would be in the shot, to provide some backlighting (rim-light). After testing these flashes, the lighting looked pretty cool but I needed to get the torches to look like they were providing all the light - which at 1/250th second sync speed they definately didn't. By dropping the shutter speed progressively down, I could find an exposure that began to include the torchlight; 1/60th looked OK but produced quite small pools of light from the torch beams. 1/30th improved things and 1/15th looked better still - BUT - at 1/15th second there was too much motion blur in the bike and rider and light trails from the torches. 1/30th of a second looked the best compromise. Here's the straight shot at 1/30th second with 3 flashes. Hmmm. Good lighting, nice LED torch exposure. But I'm not quite happy...The bike looks too static. If I introduce a slower shutter speed I get more motion blur - that's good - but I get more light trail and less sharpness - that's bad. I figured that the easiest way to do this was shoot two frames, one at 1/30th and one at 15th. 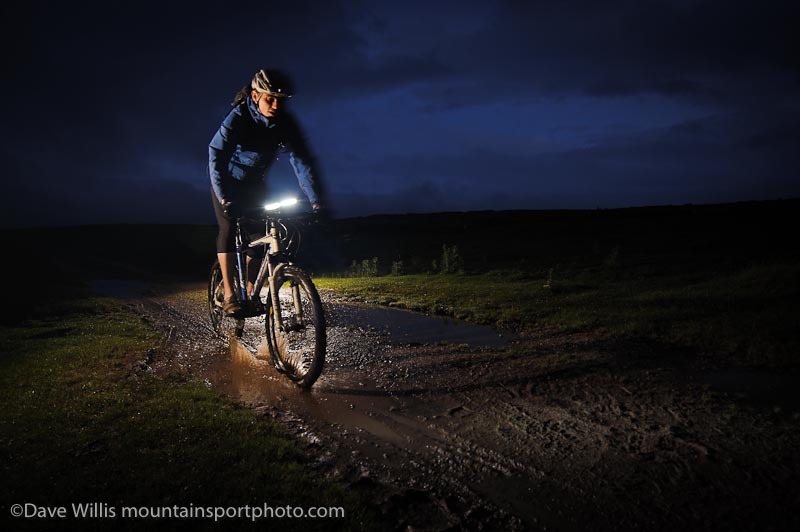 The 1/30th would be a slow ride through the puddle to get good image sharpness with the flashes. The 1/15th would be a fast ride through the puddle to get some water splash and some motion blur. Then it's off to Photoshop to blend the two together! Here's the 1/15th second shot. The rider is going pretty fast so we got a good puddle splash but also a lot of motion blur/light trails in the torches. By blending the sharp rider/bike/torch image above with this motion blur/puddle splash image in Photoshop I created a sharp image with a better sense of movement and speed. As a finishing touch, I dropped the white balance towards tungston, to "blue" things up a bit and enhance the night feel of the photo. Click on the photo above to see all three versions in a slideshow. 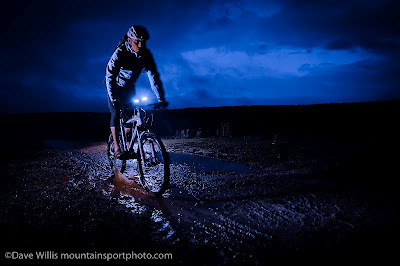 I've found that experimenting with night shots and torch light has been a real problem solving excercise and I think I've still got some way to go to get the best out of this style of photo, but we'll see. In the mean time, the shot worked well for the client and has been used prominently in their brochure, so...success! So much of photography comes down to problem solving - that's really the essence of what we do. Think of an idea, plan it, test it and solve the problems. It's fun and it's a challenge. Hiya! Do you somehow verify that the content of your domain is exclusive in the web and no other blogger is using it without letting you know about it?